At Ohno Seiko Co., Ltd., our lapping operation can produce a surface with an ultra-mirror finish that has a roughness of Rz 0.2 or greater. Lapping (mirror polishing) refers specifically to using a lapping machine. An object is placed on top of a planar stand, and an abrasive slurry is introduced in between the lapping machine and the polishing surface of the workpiece. Pressure is applied from above the workpiece initiating a process called sliding to polish the surface. Polishing the surface that has undergone cutting and grinding processing, etc., helps prevent deposition or adhesion and the lifespan of the product can be increased. In order to achieve this, we offer this processing method for products that undergo gauging, swaging, punching and friction. Our technicians conducted countless tests on the procedures and methods that involve abrasive slurries and lapping, etc. After a lot of trial and error that spanned over 2 years, we discovered a special abrasive slurry and processing technique. In the end, we were able to achieve a surface roughness of Rz 0.2 or greater even for products with irregular shapes. This is why we are confident in our lapping methods and techniques. Please feel free to contact us about your needs, regardless of the configuration or surface roughness requirements. The performance data is made available in our company’s quality manual, which we will gladly provide. In addition, we also have our integrated measuring instrument for surface roughness and shape profiling which is available to support single work requests for configuration and surface roughness measurements. ※Click the image to enlarge. In order to produce surface processing with a surface roughness dimension tolerance of Rz 0.2, we first performed processing with our surface grinder. Next, in order to grind down the polishing surface, we used sand paper (#1000, #800) to perform the processing. However, it was difficult to polish the surface evenly, and the flatness results were poor and we could not perform the processing within the required dimensions. Yet, we never gave up trying to figure out what the problem was. Finally, we were able to solve the problem. 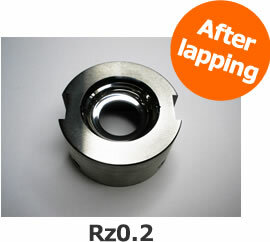 We kept scratching the surface during polishing in order to produce an aluminum surface roughness of Rz 1.6 or greater. This scratching was caused by small contaminants and by-products. Aluminum polishing was extremely difficult and we had a lot of difficulties. The careful removal of all contaminants was paramount. We had the most problems trying to produce a surface roughness of Rz 0.2 or greater on an internal diameter. Since the testing was not working with conventional abrasive slurries, it sounds like a joke but we tried all sorts of things: oil, moisturizing cream, etc…So, no matter how much we tried, we just could not seem to achieve the surface roughness we wanted. After a lot of trial and error, we found an original abrasive slurry recipe and were finally able to produce an ultra-mirror surface finish with a surface roughness of Rz 0.2 or greater! To make further improvements in the future, we will continue to dedicate ourselves to pushing the envelope and will strive to produce products that customers can count on.